Kiwi Orchid Bark has a great following and is renowned for its reliability, cleanliness, uniform grading and longevity. Customers feedback on this product include: "It's so clean", "There is no dust in the bark so it doesn't smother the roots which means we have less root problems using K.O.B. ", "It is very even in size" and "It lasts a lot longer than all other orchid barks". 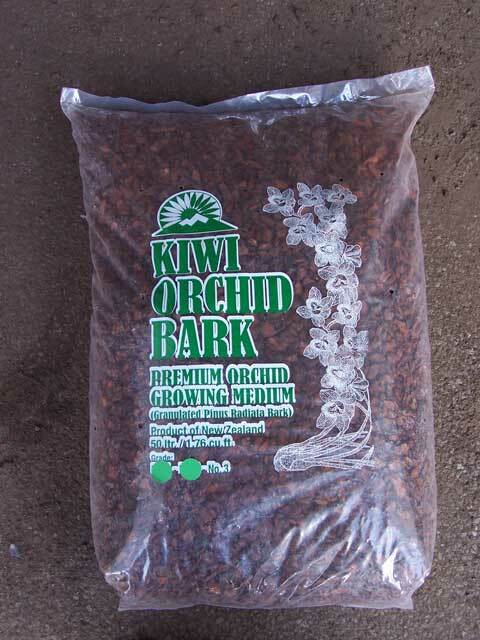 Give Kiwi Orchid Bark a try, its quality and performance will be a "Game Changer" for you. 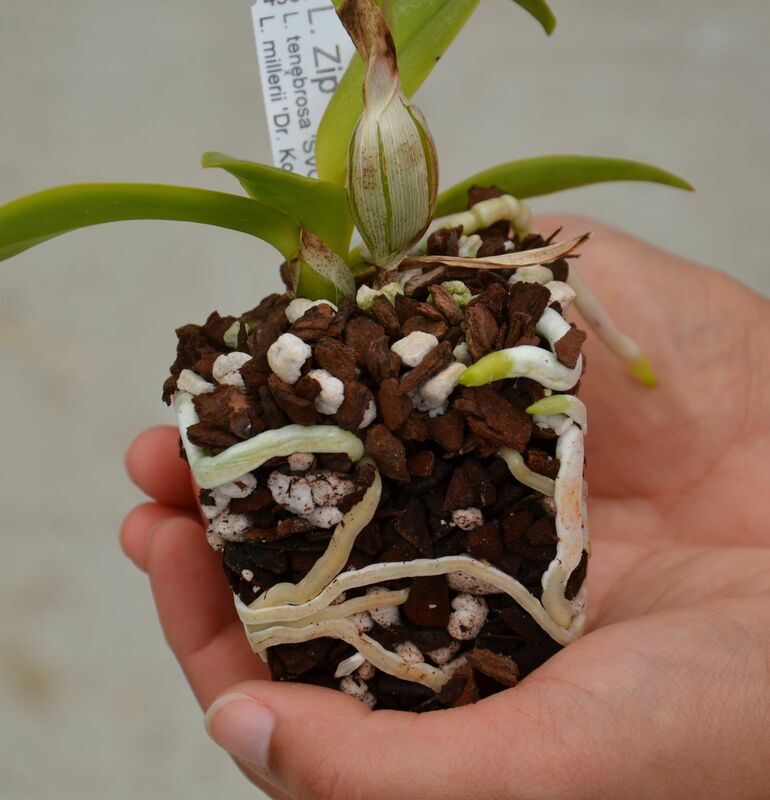 From Sunset Valley Orchids, Fred Clarke's "Fdk. After Dark 'Black Diamond". This beautiful flower is grown in Kiwi Orchid Bark. The world famous Kiwi Orchid Bark number 3. This Dendrobium Thyriflorum was a grandchampion at the last NZOS show for LeeRoy Orchids. Tauranga 2017, LeeRoy orchids display. Lc.Miss Wonderfull "Rubens". From Fred Clarke "Sunset Valley Orchids". C.dowiana v.rosita is another beautiful orchid from "Sunset Valley Orchids". Of course it is not only the bark, but also the great skill of the grower that have achieved these beautiful flowers pictured, but these growers prefer to use Kiwi Orchid Bark, and they only want the best for their flowers and to achieve amazing results. There has been a lot of propaganda regarding the benefits of treated bark (also referred to as aged or composted Bark). However, there are some drawbacks to composted bark. The composting of any organic material, including bark, causes acidification, the lowering of pH. To counteract this problem, lime is added to raise the pH back to neutral. Liming is holding the pH for about 18 to 24 months. After that the Ph begins to drop. When the pH drops the root system may suffer. This of course is a real problem. 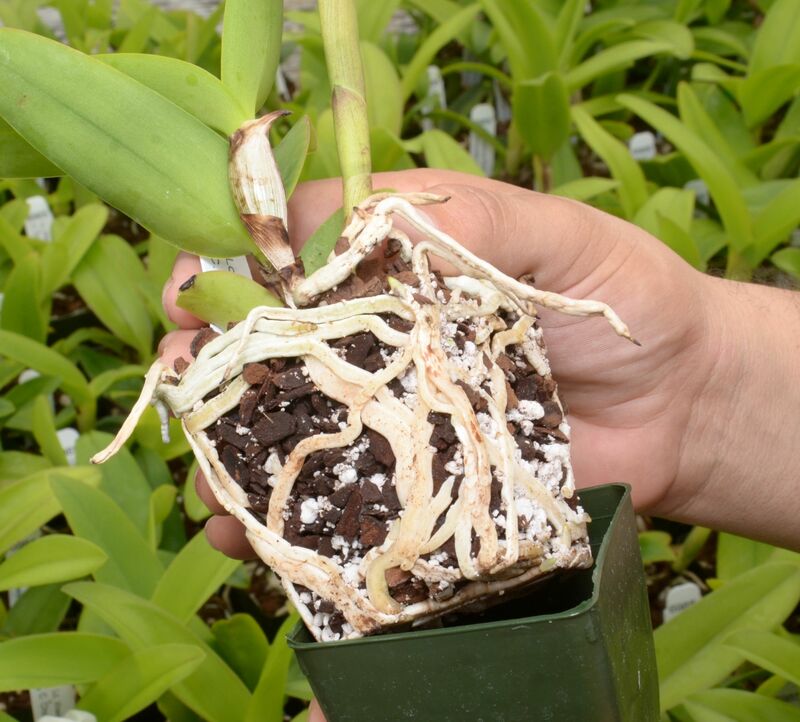 Root health is essential to growing good Orchids. It is possible to offset the pH drop by reliming composted bark. I am not sure how re-liming is best accomplished, as orchid media is a soilless, very open and well drained media. Research should be done on how best to accomplish this for growers using composted (aged) bark. One solution would be to re-pot once pH begins to drop this increases the costs. However, knowing when to do that is requiring constant monotoring and extra costs. I have experienced no such problems with Kiwi Orchid Bark and that is one of the main reasons I use it. 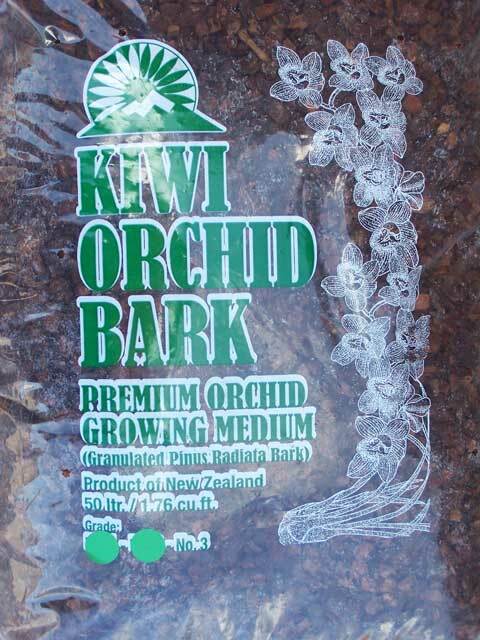 Kiwi Orchid Bark holds up extremely well and exhibits little to no appreciable decay, even after 3-4 year. All bark imported into the USA or Australia must, by law, be fumigated with Methyl bromide or heat treated. These important regulations are to assure that no unwanted organisms are introduced. 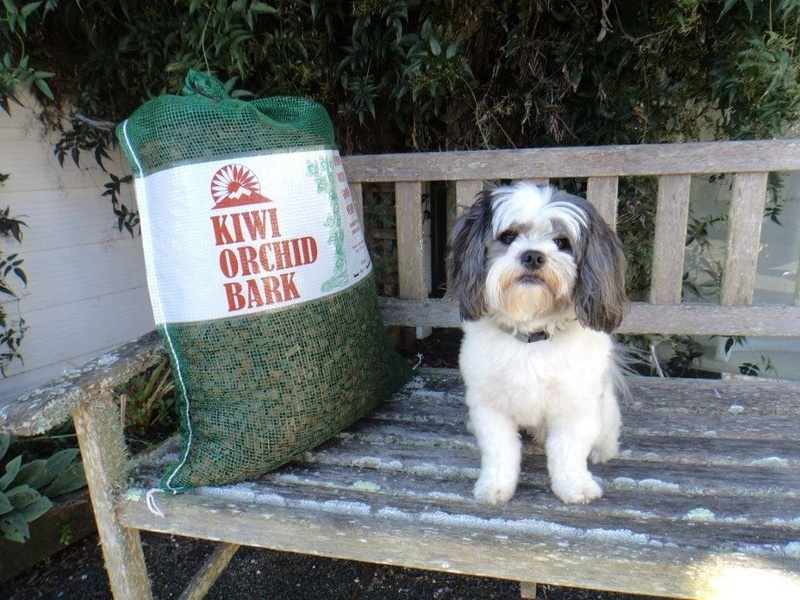 Kiwi Orchid Bark is compliant with these regulations and as a result is 100 % free of pathogens and weed seeds. At Bark Products Taranaki, every load of bark that comes in is inspected by the owners and followed through the milling process to assure the highest quality. The year to year consitency of Kiwi Orchid Bark has been exceptional. I am convinced that it is the best orchid bark on the market. 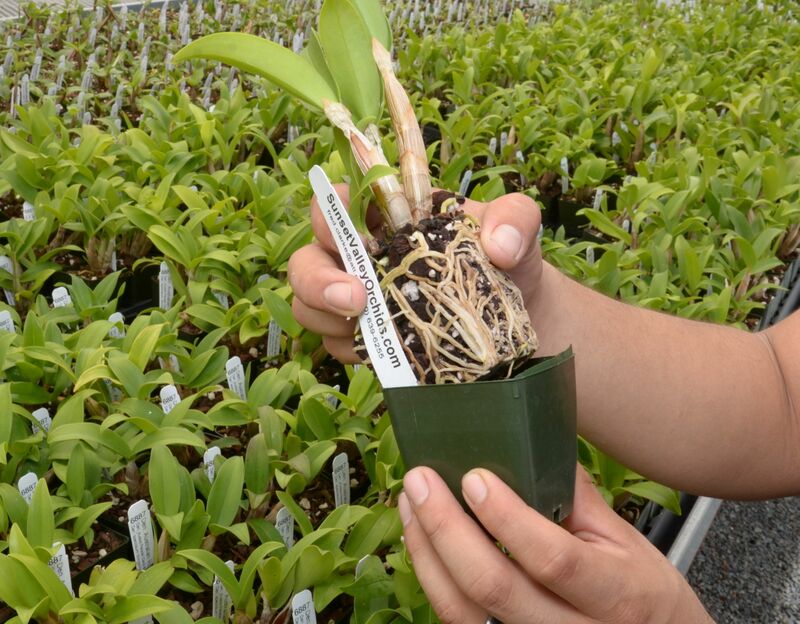 Most Orchids have trees as their natural habitat where orchids thrive. You cannot get a fresher bark then that. 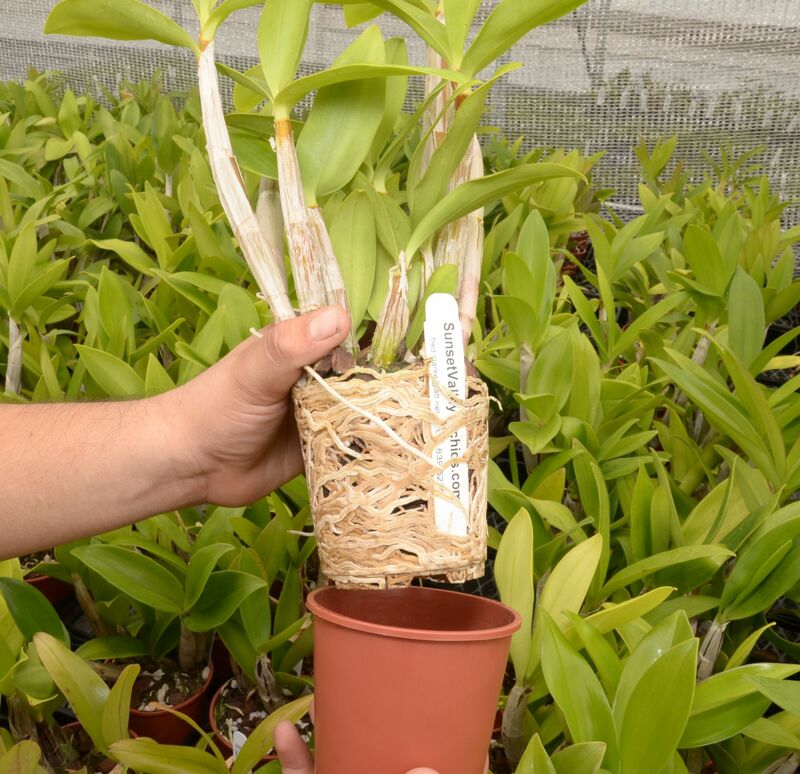 A grower puts his orchids in pots to conveniently work with them. If one follows the logical line of thought, then one puts fresh bark in the pots to mimic the natural habitat. That is why "Kiwi Orchid Bark" is Fresh Bark and I use it for that reason. If a grower, using Fresh Bark lets it dry out it will be harder to get it moist again, but regular watering will avoid that. I have a consideral amount of Orchid Books written by Ritterhausen, Rentoul, Northern and many more. None of them mention aged bark. As a supplier we are always looking at innovative ideas to fulfil the needs of our customers and recently we reviewed our packaging for several of our international customers. 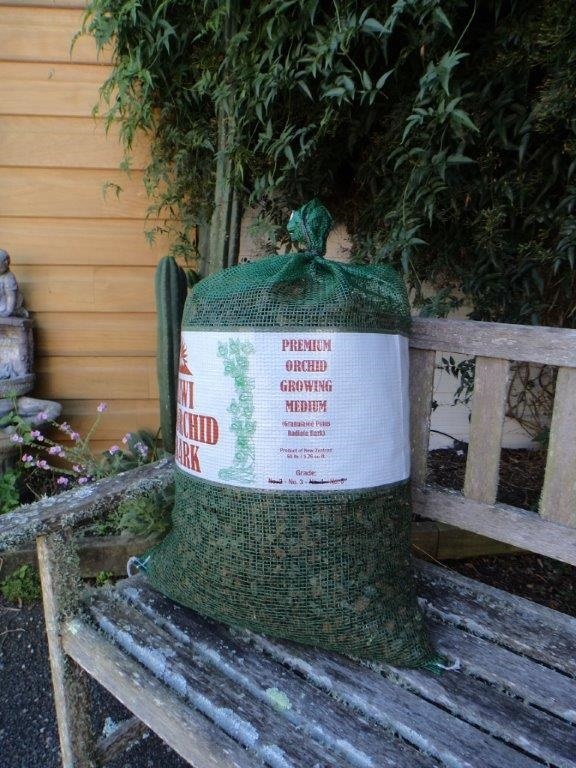 In 2015 we sent a 40 foot container of Kiwi Orchid Bark to Hawaii in the green woven bags (see pictures above of the product in the green custom made bags). They are proving very popular, so much so our viscious dog Obie has to guard them! The bags help reduce moisture build up (sweating). So the possibility of mold forming is reduced to an absolute minimum. The bags are reusable and easily resealable. They meet quarantine requirements and stand up to the heat treatement. Feedback from customers was tremendous. They now put the bags of Kiwi Orchid Bark directly into a water/fertilizer mixture the night before use. Next morning, the bark has absorbed all moisture and added fertilizer, without even having to remove the product from the packaging. This stopped double handling of the Bark. 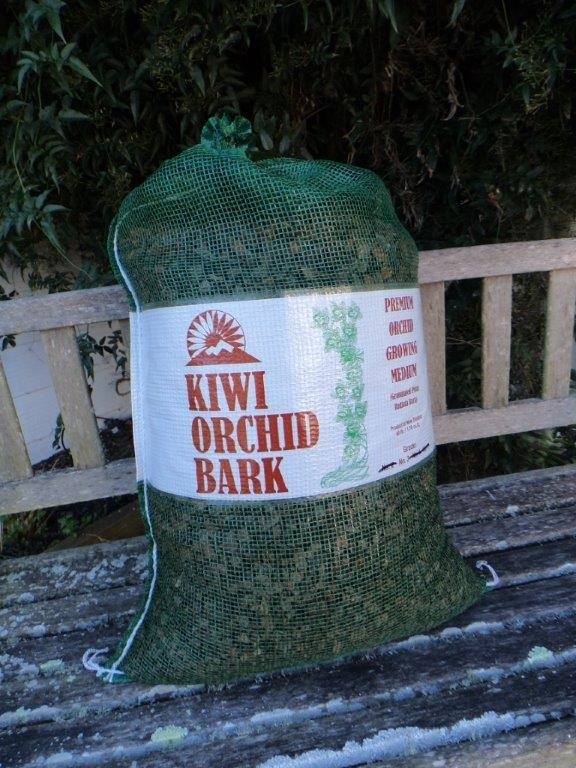 Plastic Kiwi Orchid Bark bags, are still available if required.